Sooo... Thinking of trying a pipe. My grandpa and great uncle smoked pipes and I remember the smells vividly. My dad dabbles in pipes but mostly sticks to cigars. I love my cigars but sometimes I don't have the hour to finish one so I'm think that a pipe might allow for some of the same relaxation. So...where do I start? I think I have a corn cob pipe laying around in storage somewhere. You might start by buying some pipe cleaners, a pipe tamper, and some Lane 1Q pipe tobacco blend and see if you take to it. Thanks! I wasn't sure about all the tools needed other than tobacco and a lighter. Why the Lane 1Q blend? The Lane 1Q blend is AFAIK the best selling tobacco blend out there. I just recently tried it and it's pretty good. When you go to a B&M they'll have their own "house" blends with different names and it's usually just the Lane 1Q blend. It helps to have a soft flame lighter or matches to avoid scorching the pipe. I made a pipe rest out of an old belt (you'll see commercial examples of this online) and use the corks out of liquor bottles (the kind with a larger wooden base) for pipe knockers. Just was giving you the minimum you'd need to go on. If you don't have a local B&M you can try a drugstore that sells tobacco and pick up some pouches to try. I'm not much of an aromatic pipe tobacco smoker and I've heard that some of those like cherry can be pretty goopy and disappointing, but YMMV. I like blends with Latakia in them and blends I like are Early Morning Pipe, Squadron Leader, Three Oaks Syrian, Bengal Slices, Mixture 965, but I haven't tried all that many different blends. You can save money by buying in bulk (like the Lane 1Q) and jar them up or just buy in tins. If you go for tins, use them up in about a month or transfer the tobacco to a small canning jar to keep them fresh longer. Some people buy the heavier tobacco blends and age them like aging cigars, sometimes for five years or longer, but this is a bit of a rabbit hole, you probably just want to put your toe in the water right now. IMO aromatics are not the best way to get started. they are more temperamental and can be very frustrating for a beginner. Get a pipe tool and a couple of cob pipes, send me your addy and I will put together a small sampler for you. If you decide you like it I have a few pipes I can send your way as well. I highly suggest the pipe route. Very enjoyable! Tons of info on YouTube if you are looking to learn. It truly is a massive resource. Nate introduced me to pipes and I love them when it's cold. They work perfect for me a couple of months and it's cigars the other 10. "Come party with me in Tennessee for my birthday July we can smoke in the Smokey's." Danger, you are embarking on another slippery slope, don't ask me how I know. Yeah I enjoy a pipe probably once or twice a week when I dont have the time for a cigar. I cant really give recommendations on tobacco yet as I am still learning but there are some really good ones and start cheap on the pipe to get started. At this point, after researching pipes, I am interested in starting, but I feel the same way when I was purchasing cigars for the first time. Could someone elaborate more on pipes? -Why are stem length different? -What is the point of different bowl sizes? -How do you clean a pipe? -Difference between a corncob, meerschaum , or briar pipe? -What are aromatics? Why are they harder for beginners to smoke? -What pipe tools do you need and what are they used for? -Are there mild and full body blends? -Can you mix blends to create your own? -Is pipe tobacco short or long filler? -I heard a rumor that you need to twists the tobacco when packing it in a bowl. True? -How do you pack a bowl? -What kind of lighter. Soft flame or jet? -Do you char the tobacco as you do a cigar? -How should pipe tobacco be stored? In a humidor? How do make this text turn upside down? oh, wow, you definitely know enough to ask really good questions! I'll answer more in a while, going for a walk on the beach now. OK, a disclaimer--much will depend on your preferences. You won't know what those are until you experiment. For instance, I cannot enjoy most aromatics, they taste harsh to me, the flavors added to the tobacco taste artificial, and often the taste of the tobacco itself is overwhelmed; the topping and casing is usually applied with a carrier of propylene glycol (PG) which also keeps the tobacco too moist and steamy/hot for my taste. But I also dislike latakia, used in most English and Balkan blends. You may just adore these however. That's an aesthetic privilege of the pipe carver and evolution of the shapes over the last few centuries combined with the taste of the buyer. There are 'nose warmers' with really short shanks and stems, Canadians with really long shanks and short stems, etc. Part of the choice will come down to how you smoke, do you hold the pipe in your hand and take occasional puffs or clench it in your teeth. A long straight pipe has more leverage and if heavy will be unpleasant for clenching. A bent pipe overcomes some of the weight/leverage by offsetting the balance closer to your mouth and is often preferred by clenchers. A good first pipe would be a modestly sized billiard; many claim they are the least fussy. Some tobaccos or cuts of tobacco taste better in a short, wide bowl. Others in a medium, others in a tall, narrow bowl. The width and height of the bowl creates different, evolving, flavors, burn hotter or cooler, incorporate more or less air per puff. When one finds the right combination it can be magic. Bowl wall thickness plays a factor in how hot or cool the tobacco burns, but so does smoking style, blend, and cut. Run a pipe cleaner through it while smoking if it starts to gurgle, otherwise do so after you smoke. Don't take the stem off until at least 1/2 hour or you will eventually risk a loose stem. After a one or two bowls I put the pipe in the back of the rotation, giving it at least a couple of days to dry out. Cake will slowly build up in the bowl sides. The standard advise is to ream it back to about the width of a dime. I use a pen knife but many invest in a reamer. For a start I would suggest some pipe cleaners and a 'Czech pipe tool' which contains a tamper, a poker for loosening a too-tightly packed bowl, and a spoon for scooping out the 'dottle' at the bottom of the bowl. A cob is the least expensive, cool-smoking, quick-drying, inexpensive. I love mine. Meers impart the least flavor to the tobacco, think 'neutral', and they are fun to watch color over time. Just don't drop them. Briars are very resistant to burning unless you smoke like a furnace, well cared for they will last a lifetime. Some are utilitarian, others are amazing sculptures with incredible grain and cost quite a lot, think 1-2 thousand dollars. I'd suggest a cob and a briar or two in the $75 to under $300 price range. Yep. Blends that contain a lot of Cavendish or white burley tend to be mild, ropes tend to be very strong nic-wise, VA's tend toward the naturally sweet, fire-cured Kentucky strong and smoky, straight burley in a shag cut will put hair on your chest--Five Brothers comes to mind. While you can certainly buy whole leaf, all pipe tobacco needs to be cut in some way. Flakes are pressed in bricks and sliced, ready-rubbed are flakes that have been rubbed out, and many blends are ribbon or shag cut. Most smokers will fold, twist, or rub out flakes to get them to burn evenly. Packing a pipe is an acquired skill and depends on the consistency of the blend. Moist blends often benefit from some drying time, pliable but closer to dry but short of crispy, much like cigars, speaking of cigars--C&D Habana Daydream and GL Pease Robusto are blends that incorporate cigar leaf, both good. With ribbon cut types, bottom third very gently, middle third light pressure, top third heavier pressure is one way. Cube cut burleys are usually gravity fed, flakes are either rubbed out or folded. The compressed cube cuts and flakes will expand while burning so best to not pack too tightly. -What kind of lighter. Soft flame or jet? -Do you char the tobacco as you do a cigar? Never a jet lighter, you'll for sure burn the rim of the pipe. Soft flame or wooden matches. Do a false light. Stop for a minute, tamp, and re-light. Expect to light several times during the course of the bowl. Slow puffing is the best way to bring out the true flavors of the tobacco, fast puffing creates too much heat. PM me if you have other questions, would like some samples, or if the couple of links in this essay get expunged. sheesh, can't even print s.h.a.g on this forum. 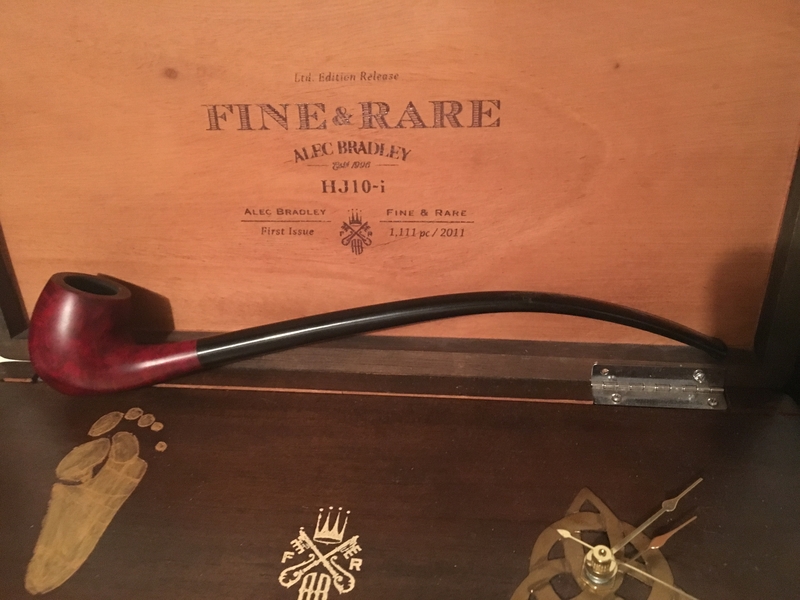 Being a cigar guy and giving the pipe a try for the cold days I was underwhelmed. I was hoping the pipe would be close to a cigar and it was not. I tried a bunch of stuff and well SG xxl rope and Virginia flake were best suited for me. I still smoke a bowl now and again but I bought a crap load of cigarillos for the cold. Pipes are harder then cigars since there are more tobacco blends a ton of pipes and companies and a learning curve for cigar guys. Great info. I still prefer a cigar over a pipe, but it adds a nice variety once in a while. Haven't fully committed to an expensive pipe yet. Dry out the 1Q a bit first. Thanks for all the info especially @silvermouse;! I went to a pipe shop, "El Humidor" and talked with the resident pipe expert, Doc who gave me a thorough guide on pipe smoking, packing, cleaning, and refinishing. He pointed me towards estate pipes for a clencher. I went with a Dr Grabow Briar pipe and got 4 ounces of house tobacco that Doc blends himself, called Doc's Blend for a daily smoke and Butter Rum for the mornings. After smoking a few days I notice the pipe tobacco I bought is more mellow than my cigars but more convenient. I can light up, take a few puffs, choke it out, and save it for later. One bowl lasts me all day and the smoke smells amazing! I will have to experiment with more blends. Can anyone recommend a full bodied blend? pm your shipping address, I've got a few tins to send you that are full bodied. So, i've been lurking around this section of the forum for a couple of weeks now. I've been reading just about everything. Good stuff guys. Took the plunge and got a cob and a shape it yourself briar blank and some 1Q. I've been turning and sculpting wood for a living for many years so shaping a pipe will be fun and i have the tools to do it.. I'm thinking Bulldog for my first one maybe a free form after that.. The 1Q is a bit mild for me so i took a couple of leaves from my rolling bench of Pilito Cubano ligero that is kind of sweet and strong and shredded them fine so i could add a pinch to the 1Q to build a little strength. Taste is still pleasant but there is more bottom end. I'm looking forward to learning more about pipes and more about blending tobacco.. Thanks again for all your great posts guys. If any of you guys getting into pipes are interested I have a few cleaned up estate pipes I am thinking of putting up on the open market. It is nice to have a few to rotate through and experiment with. When I was at Beehive on Sunday, I caught the Nording bug. Gonna take a few of my estate briars to work and see if some of the guys who smoke cigars are interested in trying a pipe out. Some me things I have learned? I am not hugely into straight stem pipes, unless they are the nose warmer type. 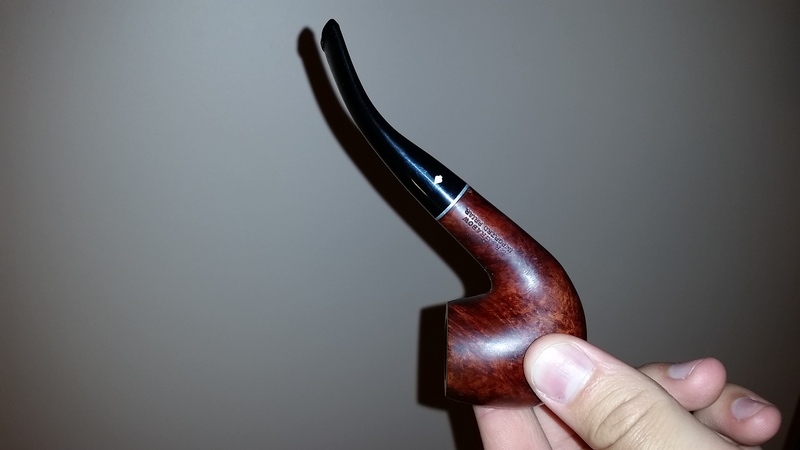 I dig bent pipes, and would like to try a church warden. I still don't have a preference on bowl type (is that normal?? ), and I find cleaning my pipes to be very therapeutic. 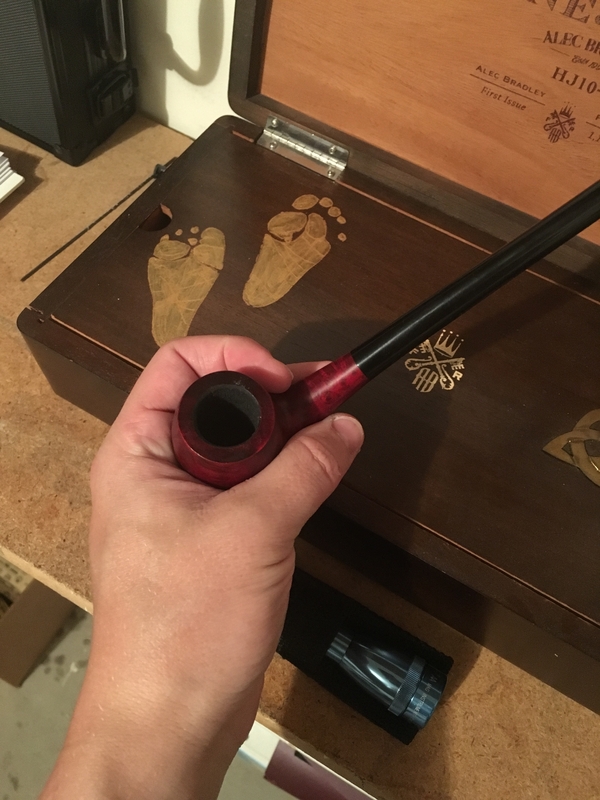 So, almost a month after I started this thread, I finally found the box and unpacked my corn cob pipe. I want to clean it well before using first. Now to find a lighter (or just use matches) a tool and some baccy. I always like the bent stems, too. I seem drawn to Dublin bowls, but have also been satisfied with others. A few years back I tried pipes for a bit but I had such trouble with them I didn't pursue it much. A a little while back my wife bought me this as a gift and I've been toying with the idea of potentially trying it again. I did figure out I'm less of a fan of aromatics, at least I was last I tried it out. Suggestions for a tin of fuller bodied less "foofie" (dunno what else to call it lol) stuff to try for getting back into this maybe? If anything I would smoke 2-4 times a week of I had to guess. When it comes to pipes it would be equivalent to me trying my first beer, 1000's of choices and completely ignorant and overwhelmed.